Hi, I also have this plate but it has been painted in a different way, using a different technique. 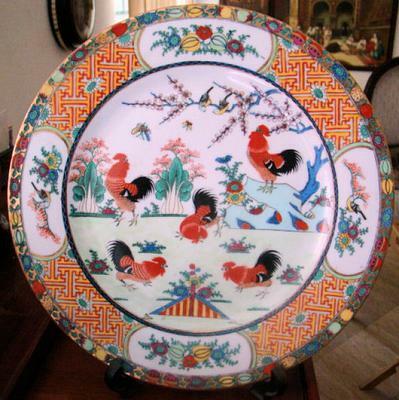 It isn't as neat as the plate shown and the chickens are painted in a relaxed more expressive style. I believe it has been hand painted - could it be a copy of some-sort? I'm wondering if you could possibly tell me more about it? On the back it says made in China but it is in English and writes in a circle. 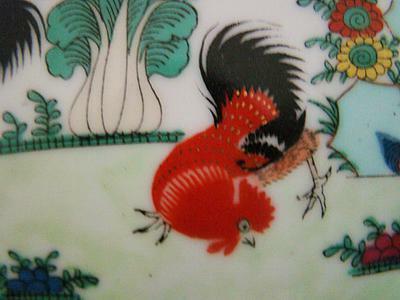 I suspect that this type of item was made over an extended period of time (perhaps still is) as the Chinese like the rooster motif. If I remember right I have even seen printed ones. You will find another mark taken from such a plate here. (It is the third from the top.) I would think that plate is perhaps 1930s or 40s, but I never really could identify the mark. 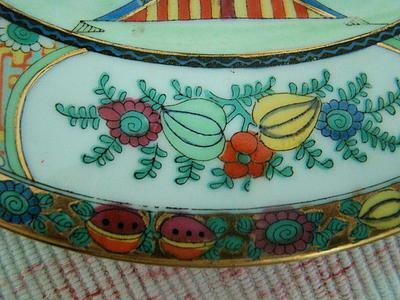 According to Gotheborg.com, similar plates were made by Mr Kung's Wah Lee factory in Peng Chau, Hong Kong betweenn the 50s and 60s by workers from Jingdezhen, so should it be considered vintage? Some of these plates bear the mark Wah Lee but some have no marks, like mine; which I bought at the beginning of my hobby. But I don't understand why this plate bears the words "made in Chinea" in simplified characters. Such plates would most likely be about second or third quarter of the 20th century. In this case I vote for third because of the mark. 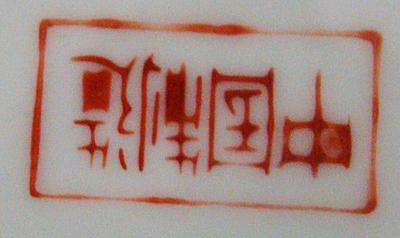 It uses simplified characters which were only widely used from the 1960s.